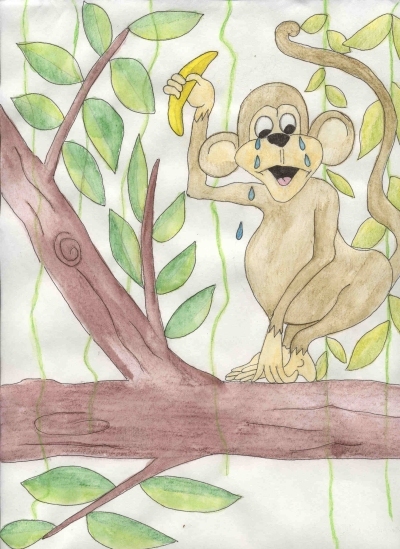 Children's Stories - Cry Baby Monkey! Dodo, the monkey, jumped up and down on the ground. He howled angrily. He often had temper tantrums. Whenever his mother didn’t give him his own way, he acted like this. "I want the big banana!" he cried. His feet stomped on the ground as he yelled, "I want it! I want the big one! I want it now!" His mother looked at him and shook her head. Dodo’s little sister, Zu-Zu, was eating the big banana and loving every bite. She smiled as she gobbled it down. "Dodo, you can’t have my banana. You can have this one," she said, trying to give him a much smaller one. Dodo stopped and looked at it. It was plump, bright yellow and had brown freckles all over it. His mother peeled it back for him. "See, Dodo. It looks delicious, doesn’t it? Just smell it too," she said, sniffing it. Dodo pushed it away. "I don’t want that banana. I want that one!" he whined, pointing to Zu-Zu’s banana, which she had almost finished eating. Zu-Zu popped the last bite into her mouth. Dodo cried more and more. His mother thought about the way he was behaving. What should she do? Dodo was acting like a big crybaby. She took Zu-Zu’s hand and walked off into the dense forest. "If you are going to keep acting like that, you’ll have to do it here, alone. Zu-Zu and I are going back to the tree. Come on, Zu-Zu." Dodo kept crying. He held his long brown tail and fell to the ground. He stomped his feet and pounded his hands into the dirt. Nobody was around to hear him cry. Nobody was around to see him squeeze his tail and nobody was around to watch him kick the ground. After a few minutes, realizing he was alone, he sat up. He looked around the forest. He saw a large green snake slithering up a tree trunk. He noticed two pale blue parakeets sitting on a branch, chewing berries. He could see bees and beautiful butterflies fluttering and buzzing around some bright pink hibiscus. None of the animals in the forest were nearby. He noticed that his mother had left the small banana for him, so he picked it up and gobbled it down. He walked over to a vine that was dangling from high up in a tree. He started swinging back and forth on it. Some sticky banana mush was on his fingers and it made him lose his grip. His hands became very slippery and he fell from the vine, landing with a thud on top of a huge palm leaf that had fallen to the ground. He started to cry. Dodo’s mother had walked back to check on him and saw him sitting on the ground. He was still crying. She shook her head and walked away, thinking that his tears came from wanting the big banana. Dodo knew that nobody was there to hear him cry, so he stopped. Using his arm, he wiped the tears from his big brown eyes and then he wiped his sticky hands on his fur and walked further into the forest. Maybe his mother had another big banana for him. A tree trunk had fallen across the path so Dodo had to jump over it. A puddle of rainwater looked like too much fun to pass up so Dodo jumped into it. Mud splashed all over him. He was nearly home when he noticed a family of wild pigs. They were standing in the middle of the path. Not wanting to annoy the mother pig, which was leading her six piglets through the forest, Dodo ran around them into the bushes. That’s when he spotted a banana palm. It was filled with huge, ripe bananas. They were much bigger than the one Zu-Zu had eaten earlier. Dodo ran over to the tree and picked a few. He peeled them and ate them all. He picked a few more and ate them too. Before he realized it, he’d eaten every banana in the bunch and felt quite full. "Dodo, come home," he heard his mother call. He ran to the tree. Zu-Zu was up in the branches, munching away on a mango. Mother saw Dodo coming. He was covered in mud and had twigs in his fur. "Go down to the river and wash up. Hurry back. I’ve got a surprise for you," she said. Dodo ran down to the wide river. It was moving quickly. He saw several deer trying to cross it and a Chinese alligator lying on the riverbank, watching the deer. Quietly, not wanting to disturb the big animals, he washed himself off and ran home. His mother was smiling. "Dodo, I know that you wanted the big banana today and didn’t get it, but I’ve got something even better for you. Here," she said, handing him three mangoes. Dodo looked at them and started crying. It wasn’t because he wanted bigger mangoes, or because he wanted more mangoes than Zu-Zu had. It was because he was so full from eating all the bananas earlier that he didn’t have room for anything else. His mother looked at him. Zu-Zu looked down from the treetop. He sat on the ground and cried and cried. Mother didn’t know what she was going to do with him, but she was thankful that he wasn’t stomping his hands and feet and squeezing his tail.